Yearning for some green in your home but just don’t have the space for a garden or yard in your matchbox apartment? How about an adorable and intricate miniature garden then? From succulents in mason and pickle jars to terrariums, Muddy Waters Mini Gardens does it all. Living life in the garden city, we all know the importance of having a little green in our lives. Unfortunately, as the population is getting bigger, homes are getting smaller, and having your own private garden or backyard is becoming more and more of a distant dream. This is where Muddy Waters Mini Gardens step in. Recognising that space is a big constraint when it comes to gardening and plants, these guys got in on the indoor plants game and took things up a notch with their miniature gardens. From terrariums to container plants, anything that falls under the umbrella of a mini garden, these guys will work it out for you. With gardens small enough to fit into a coffee mug, space will no longer be a problem. In fact, these guys can make gardens in almost anything — from saucers to glass jars. They do have bigger and more detailed pieces if you’re interested, complete with details like miniature versions of people and even little doggies. We spotted one with a mini fountain in it as well, which was simply adorable. All the plants used are very much alive, so nothing looks unauthentic. They even teach you how to tend to these babies so don’t worry if you’re a gardening noob. Started by Nirmala Prakash, the brand is only three years old. 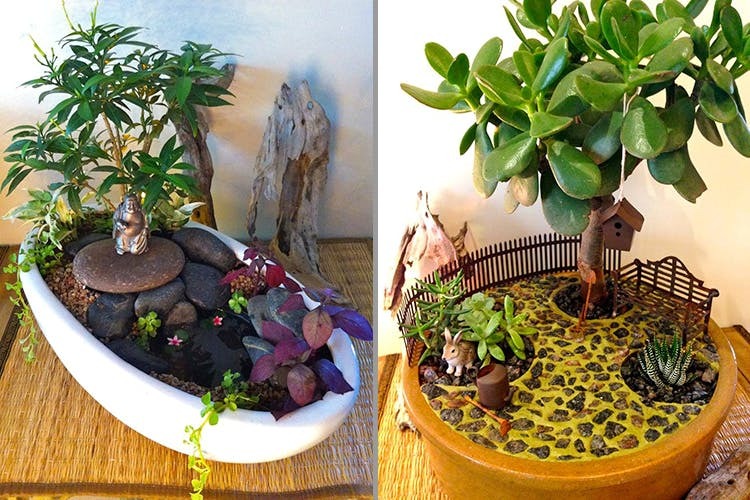 However, Nirmala has been putting together miniature gardens for the last twenty years. With a little help from her daughter Vydehi, she decided to commercialise her talents and create miniature gardens for other peoples’ homes. You can even head over to their space in Jayamahal and pick one up. Apart from adding a much-needed bit of green to your home, these mini gardens make great gifts too. Muddy Waters Mini Gardens is all set to start producing DIY mini garden kits so you can get creative and make your very own mini garden. Keep a close eye on their Facebook Page to find out more.